Under the ancient glider on our screen porch is a plastic tub of toys. We never had children, but we’ve served as babysitters for working family members through the years. Any experienced babysitter knows the value of a good toy box. I measure the quality of a toy box by the hours of peace I get when the kids are at play with the things inside it. but simple colored cubes, rectangles, triangles, and cylinders. There are also tiny action figures, small metal cars, trucks, tractors, and trains. Rounding off the bunch are cans of Play-Doh, bottles of bubbles, crayons, and watercolors. We celebrated the Fourth of July on Sunday. A few of our friends and some of Jilda’s family came. We did this to avoid conflicting with other celebrations later in the week. We had eleven adults and six kids. Most of the kids brought their electronic toys, and they sat in the living room playing until the batteries died. After that, they started getting fidgety. Our house would be considered a “tiny house” by today’s standards. When filled with family, friends, and pets, it gets cozy. Especially with restless young’uns. 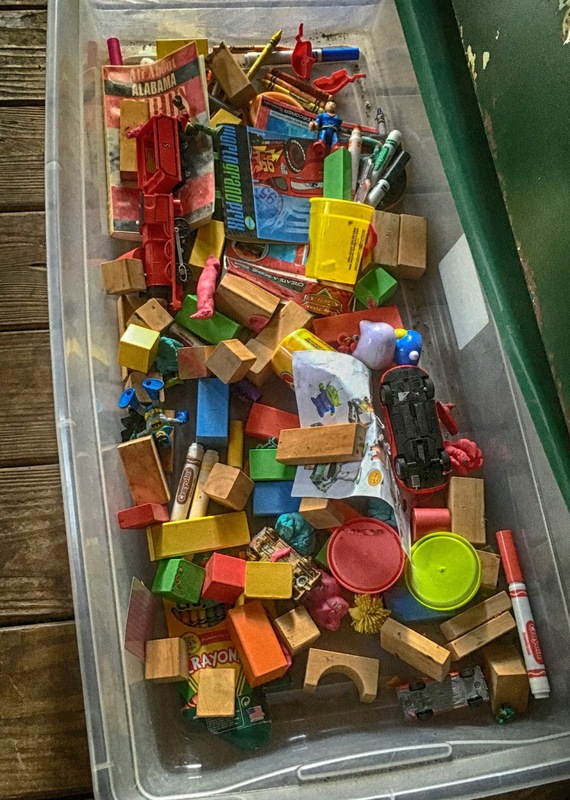 Jilda has babysitting radar, so once she realized a potential kid meltdown, she herded them to the screen porch, pulled out the toy box and let imagination do the rest. Now and then an adult would step out of the conversation long enough to check on the kids. When it was my turn, I moved to the entryway, leaned on the door jamb, and watched the action from a distance. Even though the kids ranged in age from five to 15, they were immersed in playing with the old toys. The day was warm and humid, but the ceiling fan whispered overhead making the porch a pleasant place to play for the kids. As dusk drew near, the company said their goodbyes and headed off in different directions. Jilda and I tag-teamed to do the after-party cleanup. We knocked out the kitchen and set the dishwasher to humming before tackling the screen porch. Once on the porch, there was an impossibly tall tower of wooden blocks. Each block was stacked precariously on the one below. How it was still standing, I do not know, but when I tried to disassemble the stack, it fell. I could hear wooden blocks rattling to all corners of the porch. I’m not sure if this was planned by the kids or not, but locating the blocks was like an Easter Egg hunt. I looked under ferns, statues, and behind wooden screens. I hate to see kids glued to electronic stuff. I don't have children in my house very often, but when I do, I'm prepared with Legos, some trucks and cars, puzzles, and board games--the same ones I bought for my own children. I was the mom who didn't allow Nintendo, and my kids have thanked me for the lack of it. Those toy boxes gave us hours and hours of imaginative fun. Batteries (pre electronic era) were banned by my parents, and we benefited. I bet you could have built a GREAT fort!! Jilda and you are hospitable and considerate. Kids may not express it in words, but left a tower of blocks to impress you --a great compliment. Although I have raised 4 children, I never got rid of my own old childhood toybox and now use its odds and ends in photos and doodles. Kids are pretty much like that; whatever toys fire their imaginations --and what they do with them-- leave with them as they pursue their own paths in life. I keep a toy box here at my house. it's a necessity. I've thought as some are getting older I should change things up a bit, but they still take pleasure in playing with what I've got. Play dough though is not one of my favorites. The younger generation is a good influence on us and lets us remember the glory of being a child. It amazes me that generally kids toys are played with by kids in ways never intended by the designer of the toy. As a young parent I used to say, "No, this way." Eventually I learned to just leave them alone. I have a toy box at my house too and when my great grandson Cypress come over, that's the first place he runs too. I bet you could build a tremendous fort with those pieces. My favorite aunt had no children until I had my first baby. I loved going to her house partly because she had a toy box full of small toys to keep me occupied. 'Bet if I were to close my eyes and concentrate, the aroma of Play-Doh would come wafting back. When did we adults forget to play? GGrand daughter Stella is leaning Mexican Train with out dominoes. One or two passes is about her limit, then it is stack the dominoes. I love her imagination. Thanks to share your experience about kids playing with toys. Yes, today's generation is fond of playing electronics games. Although we have grown up playing with the toys which are there in your toy box. There are many Engaging Toys For Kids in market which are also useful.